One thing that struck me was his earnestness in pushing bipartisanship, not a typical theme at Tea Party events….He spoke about having to attract Democratic votes to stay in Congress during his early years as House member in Georgia, and referred to working to get Democratic votes in the ’80s to pass Reagan’s initiatives. 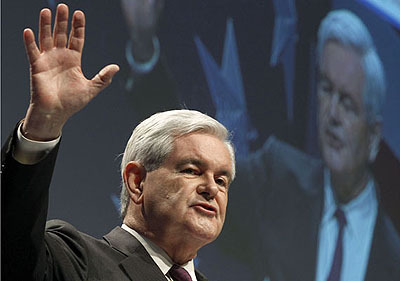 “I grew up in politics learning a lot about how you build bipartisan coalitions,” Gingrich observed. I read that with my mouth agape. If there’s a single person in the country more responsible than Newt for the poisonous state of partisan politics in America today, I don’t know who it is. Remember these gems down through the years? There’s no cherry picking here. These are all workaday themes for the GOP’s self-proclaimed philosopher king, one of the nastiest, most malignant pieces of work ever to grace American politics. Newt Gingrich extolling the virtues of bipartisanship is like Hannibal Lecter promoting the value of good nutrition.